The Cellar opened in 1970, in the basement of Fullerton’s historic Villa del Sol. The design is unique as it is the only structure outside of Disneyland that was conceived, designed, and built by Gene White, the designer of the “Pirates of the Caribbean” attraction at Disneyland. The soft lighting, chandeliers, leather and velvet upholstered seating, structured arches, exposed bricks and cave-like walls inspire nostalgia of Old Europe. With the dark colors and rich textures, the young kitchen and management team of The Cellar are serving up fresh California French cuisine, setting the tone for an unforgettable dining experience. Since taking over, owner Ryan Dudley has breathed new life into the restaurant by recreating the menu with his team: General Manager: Sara St. Pierre, Executive Chef: Sean Nemetz (nominated for Sous Chef of the Year in 2007 by the Southern California Restaurant Writers), Sommelier: Rafael Hernandez. Along with the newly developed bar menu that offers a more casual experience, The Cellar also offers a handful of dining events from Wine and Cigar Dinners to special Seasonal and Holiday menus. With this, LatinoFoodie was invited to sample some of the new dishes at The Cellar. For the tasting we had a menu of buffalo tartar, beef short ribs and their famous chocolate soufflé. I love meat. Rare. Medium Rare. Rarely raw though. Coming from Colorado, I’m used to seeing buffalo on the menu. Again, rarely raw. 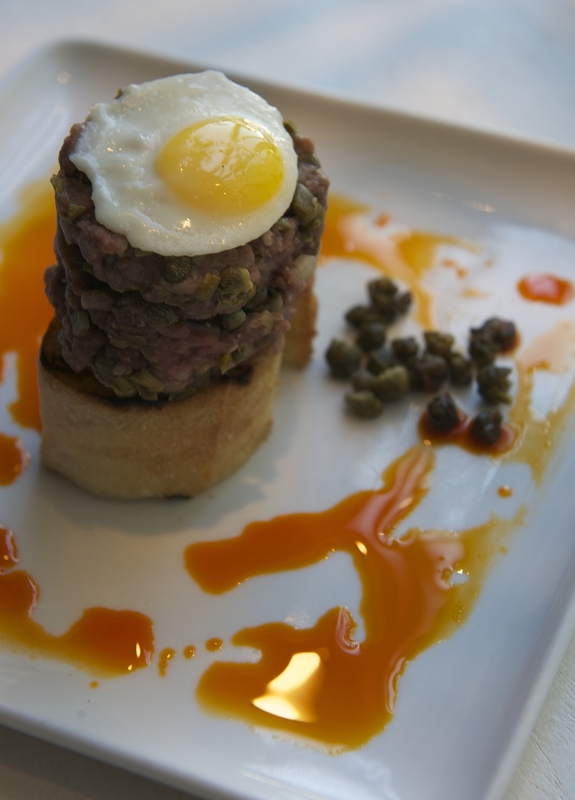 Shallots and a caper relish are folded into the buffalo meat to provide additional flavor to the usually lean meat. The toasted baguette provided excellent textural backdrop while the briny crispy capers added a pleasant salty bite. The quail egg was cute, but didn’t add much to the dish. Same for the chili oil on the plate. It was pretty but had very little taste. Aside from the garnish (egg and oil) I absolutely loved eating raw ground buffalo. 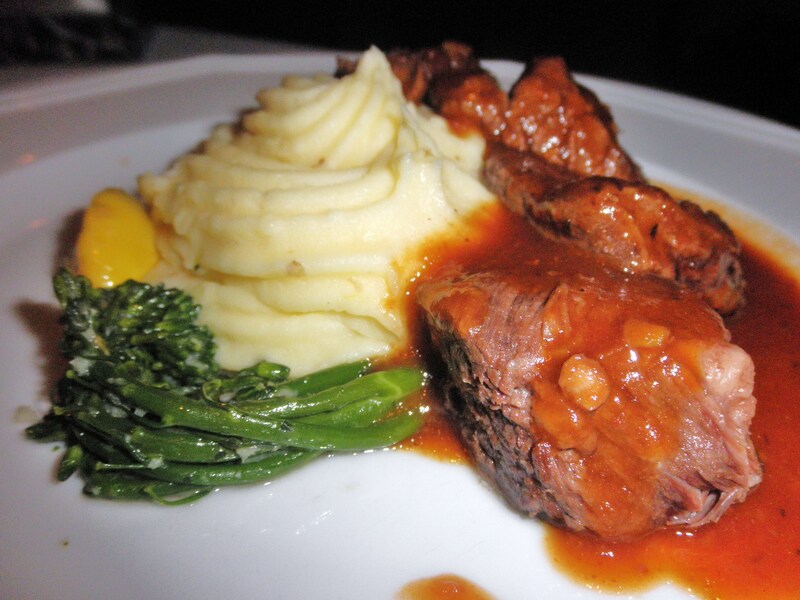 The entrée was veal stock braised Angus beef short ribs. Tender…fall off the bone…don’t even need a knife…melts in your mouth…all these apply. The green apple demi-glace adds a very slight sweet/tart tingle and is the perfect complement to the most tender short ribs I’ve ever had. The turnip and Yukon Gold pommes purée was light and fluffy, if a little under seasoned. The vegetables on the plate were broccolini and patty pan squash. Like the quail egg and chili oil, these had very little flavor and seemed like afterthoughts. Thankfully the short ribs were near perfect so I could forgive these tasteless veggies. 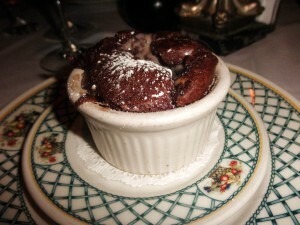 Dessert was a chocolate soufflé served with a thin warm chocolate sauce with orange zest. This steaming little chocolate pudding was the perfect ending to this dinner…so I had two. The young sommelier, Rafael Hernandez is a great addition to The Cellar’s team. Hernandez oversees The Cellar’s vast wine list (over 1,400 selections) that features a combination of old and new world wines with a heavy French and California influence. 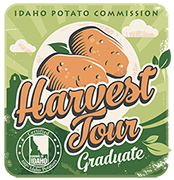 Hernandez holds a certificate in Enology and Viticulture from UC Davis, has studied in the prestigious Court and Masters Sommelier Program and is also a certified Spanish wine educator. Inspired by the entire process of winemaking, from vineyard to the dining table, Hernandez greatly enjoys sharing his passion, knowledge and expertise with patrons of The Cellar. For this particular event Hernandez selected a velvety Pinot Noir from Arrollo Grande Valley. 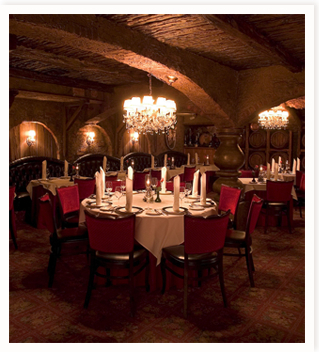 While its menu of fresh California French cuisine sets the tone for a unique dining experience, The Cellar may be one of Southern California’s only restaurants that continue to serve its entrees under a silver dome. And ask for the head waiter, Manny, he’ll take good care of you. The Cellar is located at: 305 N. Harbor Blvd, Fullerton, CA 92832. 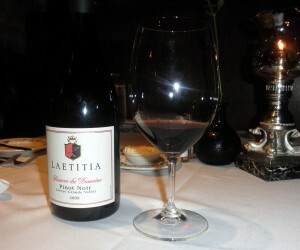 To make reservation call 714-525-5682or go online at www.cellardining.com.